This Post Is Part Of The #MYRITUAL2015 Event! My good friend Amy Won of TreeSpace Studio has invited me to participate in her “Rituals” event. I love rituals, particularly traditional rituals that have depth, meaning and story to them. For Amy’s exploration into ritual, I have decided to share two of the most currently relevant. A few weeks ago I shared a special Lunar New Year Orange peel space clearing ritual. Today, I share with you a daily ritual that you can incorporate into a daily meditation practice. I practice Shambhala Meditation, which is a path that was created by Chogyam Trungpa. He was very involved in the arts, and taught a calligraphy practice that I include before, during or after my morning meditation. Trungpa called this Dharma art, or Shambhala art, and the symbology is woven into many rich traditions such as Tibetan Buddhism, Ikebana, and feng shui to name a few. I participated in some classes that taught this dharma art style of calligraphy through the Shambhala center with Elizabeth Reid, Shastri Sandra Ladley and Anne Anderson Saitzyk. My meditation instructor, Joe Mauricio, suggested this addition to my daily practice to assist in creativity, to free my mind. I remember after he told me this, I literally ran to the art store and bought all the supplies. The next morning I was like a blissfully elated child on Christmas day. I could not wait to do the calligraphy! I truly hope that this calligraphy ritual inspires the same excitement and adds some freshness to your rituals! Anytime! But I practice this when I sit for Shamatha meditation, bright and early in the morning. I make my tea (green or chai!) and then sit at my meditation altar with my calligraphy tools. Black Sumi Ink. You can also use tempera paint if you’re on a budget. Large pieces of blank paper. I use a large 18”x24” pad of drawing paper. For me larger was better – so I could really be expansive. But regular white letter size paper will do! Optional: Red Sumi Ink. Note, the “red” ink is really more an orange. 1. Take a seat and feel your body. It’s about feeling, not thinking. “Gone, gone, gone completely beyond to the other side. I am enlightened.” This is from the end of the heart sutra, which speaks about form as emptiness and emptiness as form. If you prefer you can just sit with a moment of silence instead. 3. Look at your blank sheet of paper. The blank sheet is “square one”, an open place of not knowing, an open field of space. 4. Pick up your brush and peer into your ink. Silently dip the brush into the ink. Listen to the brush in the ink. See how the ink glistens on the brush. Observe. Be sure to do this step between each stroke as well. 5. Your first brush stroke on the paper is “Heaven." You can also call it “Space." It is your first gesture, or offering to the paper. Just one movement, your first inspiration. Remember, first thought is best thought. 6. The second brush stroke is “Earth” or “Form." This second stroke responds to “heaven” and grounds it. It can bring it weight, stability. Try not to control the brush but make friends with it. Earth is the offering you have at that moment in relationship to the first stroke. Remember, first thought is best thought. 7. Finally the last brush stroke is the “Human” or “Energy” element. This is where you can use the red ink if you chose to. The “human” element connects the first two strokes. It enhances or completes the relationship. Just like humans connect heaven above (yang energy) with the earth (yin energy) below. Again, remember that first thought is best thought. 8. The calligraphy is complete with Heaven, Earth and Human. Look at your meditation and take it in. 9. After it dries, like with a sand mandala, let it go to the universe. You can throw away (or recycle!) the paper. My teachers suggest the art is also great to wrap gifts with! Or you can give them away. But best not to save them. Then, carefully and thoughtfully clean your brushes with fresh water. This is a delightfully expansive ritual that I suggest all of you do and share with your friends. I find it is especially beneficial in the morning before your brain has a chance to jump on the daily stresses that hold back our creativity. 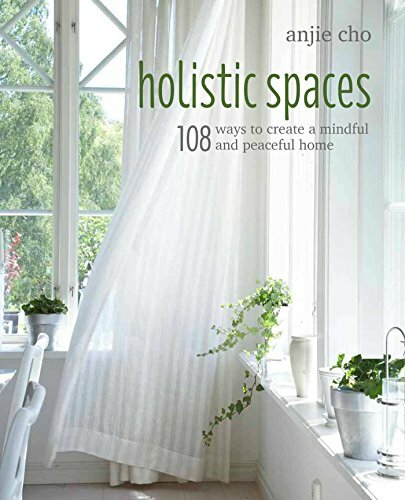 Best selling author of "108 Ways to Create Holistic Spaces: Feng Shui and Green Design for Healing and Organic Homes" and Architect for clients such as Satya Jewelry, Anjie Cho is a sought-after expert in the fields of feng shui and green living. Anjie Cho is a registered architect and certified feng shui consultant. A graduate in Architecture from the College of Environmental Design at the University of California at Berkeley, she has been creating beautiful and nourishing environments since 1999.